With Learn to Draw Disney's Classic Animated Movies, you can draw your favorite characters from Disney classics such as Alice in Wonderland, Dumbo, Peter Pan, 101 Dalmatians, and The Fox & the Hound! Learn to Draw Disney's Classic Animated Movies joins a long list of beloved learn-to-draw books that span the most popular animated films of Disney history. This guide to drawing your favorite characters digs even deeper into the Disney archives to include favorite classic characters from Alice in Wonderland, The Jungle Book, Fantasia, 101 Dalmatians, Peter Pan, The Fox and the Hound, Bambi, Pinocchio, Lady and the Tramp, The Aristocats, and Dumbo. 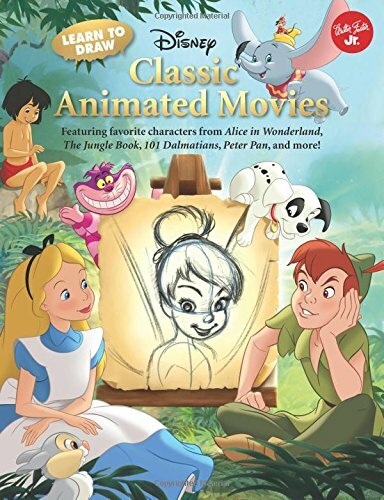 This 144-page book features easy step-by-step instructions for drawing Alice, the Mad Hatter, Mowgli, Baloo, Cruella De Vil, Pongo, Peter Pan, Tinker Bell, Captain Hook, Bambi, Lady, Tramp, Thomas O'Malley, Duchess, Dumbo, and more. All you'll need to start drawing are a few supplies. The easy-to-follow instructions in this book will guide you through each step, showing you how each step builds upon the last to create a finished piece of art. You just need to grab a pencil and apiece of paper, and your copy of Learn to Draw Disney's Classic Animated Movies. Flip to the character you want to draw. You’ll draw the basic shapes shown in step one, and move on to step two, step three, and keep going! The new lines in each step are shown in blue, so you’ll know exactly what to draw. After adding all the details in each step, darken the lines you want to keep and erase the rest. Finally, add color to your drawing with felt-tip markers, colored pencils, watercolors, or acrylic paints. Drawing tips from professional Disney artists are sprinkled throughout the pages to create a fun drawing experience for any Disney fan or aspiring artist. So grab your drawing pencils and paper and get ready to draw classic Disney characters! If you have any questions about this product by Walter Foster, contact us by completing and submitting the form below. If you are looking for a specif part number, please include it with your message.